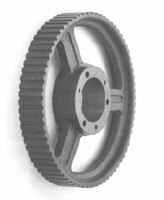 (MPB - has no setscrew or keyway) and Ful-Grip (QD) Bushed styles of bore. CURVELINEAR TIMING SPROCKETS � Advanced Tooth Profile allows for more compact lubrication free drives. A great alternative to Chain. The most advanced Synchronous Drive for high torque high speed applications. Quieter than traditional timing belt drives.